great. Better to stay put on the island, eat coconuts, play with piglets and chickens… unfortunately Moana doesn’t listen to her elders. Especially as her homeland becomes endangered by lack of food and there’s no hero on the horizon. Unless you count a fallen demigod, Maui, who might or might not help her in the quest because he clearly has an agenda on his own. A girl who’s fallen in love with the sea. A girl who wears a dress, has a pet animal and IS NOT a princess. A girl who is a Polynesian explorer with a fire in her soul, passed down through generations. What not to like? Oh, wait, I never warmed up to that chicken… half-witted doesn’t fit my bill when it comes to pets. One of nicest fantasy animation Disney movies I’ve watched – recommendable! 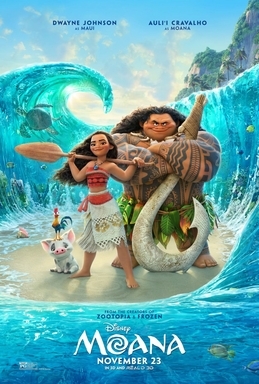 This entry was posted in animation, fairy tale, fantasy, fantasy action movie, movie review and tagged 2016, Disney cartoon movie, moana, polynesia, that's how it should be done. Bookmark the permalink. I have been meaning to watch this for a while now…. It is a very summery, holiday movie. Watch it this summer season.